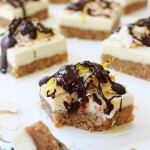 Lightly sweetened white chocolate squares made with a nut and fruit base with a creamy coconut white chocolate topping. Place dates into your food processor and blend to a paste. Combine with all other ingredients. The mixture should stick together when pressed between your fingertips. Place in a non stick or greaseproof paper line 6 inch square baking tray (or you could use a round!). Press down evenly with your fingertips ensuring its evenly spread across the base. Place in the fridge whilst you make the filling. Place cacao butter (finely chopped) and coconut butter in a jug or heat proof bowl. Gently place in a larger bowl or jug where it can easily sit. Pour boiling water carefully into the larger bowl or dish and leave the butters to slowly melt (about 10 minutes), stirring occasionally. Once melted whisk all the filling ingredients together by hand. Relatively quickly pour over your base and return it to the fridge to set for at least 3 hours or overnight. Melt dark chocolate using the same method as for the cacao and coconut butter above. Remove set lemon square from the tin. Slice into 8 – 10 squares. 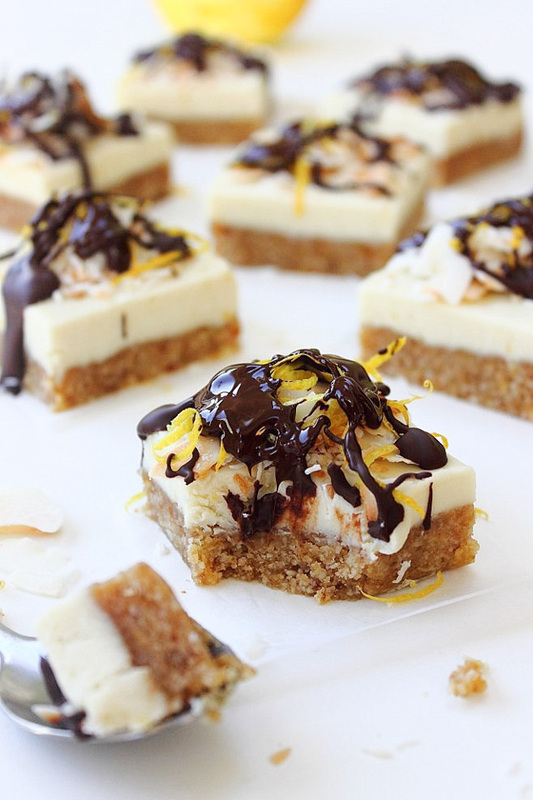 Sprinkle toasted coconut and lemon zest on top of each one before drizzling each with the melted dark chocolate. Return to the fridge for 30 minutes to set. Store in the fridge in a seal tight container for up to one week or freeze for up to one month.